With its excellent design, wide range of features, and one touch function, the Saeco Exprelia Evo (View on Amazon.com) is one of the most impressive coffee machines you should certainly get if you appreciate the authentic taste of coffee. If you’re the type who’s always on the run and want to make sure that you can prepare your morning coffee with the push of a button, then this model is definitely for you. What makes it an even more appealing choice is the fact that it can even clean itself up. Therefore, if it’s time for you to upgrade your coffee machine, you’ll certainly want to keep reading to learn more about the Saeco Exprelia Evo. One of the things you’ll certainly love about this machine is that unlike other models in its class and price range, it cleans itself up, so you don’t have to waste your time on cleaning it manually. Also, when it comes to the milk carafe, it can be easily removed for refilling and cleaning purposes. If you prefer to froth the milk yourself, then you’ll be glad to know that the Evo actually comes with a traditional steam wand that allows you to do just that. If you want, then you can also use it in order to dispense hot water for Americanos or tea. The water tank on the Evo is removable and this makes cleaning and refilling it a breeze. In terms of capacity, the tank can be filled with up to one point six liters of water. You’ve probably heard that 2 thermoblocks allow you to brew coffee a lot easier and faster than coffee machines that feature only a single block. Luckily, the Saeco Exprelia Evo features dual SS thermoblock technology, making it a breeze to steam, brew or dispense hot water. Do you prefer a stronger or a milder coffee? Regardless of your choice, the SBS system developed by Saeco will allow you to adjust the consistency of your coffee with a simple turn of a dial. Aroma is very important when it comes to preparing a delicious cup of coffee and Saeco is fully aware of that. That is why they developed their Aroma System so that you can program it to suit your tastes and easily prepare your favorite cup of coffee every single time. Not only will the Saeco Exprelia Evo auto rinse itself the moment you turn it off and on, but it also has a special descaling and cleaning cycle that kick in as well. Thanks to these cycles, you’ll find it a lot easier to maintain the machine. Did you know that you can actually customize the Evo so that it perfectly suits your needs? There are many functions you can customize, including water or milk quantity, drink size, coffee temperature, amount of coffee to grind, etc. The one touch technology makes preparing your favorite cup of coffee that much faster. This is especially useful if you’re a busy person and value your time. The traditional steam wand makes it a breeze to froth the milk yourself. Many people will appreciate this function since it gives them control over the frothiness of the milk. 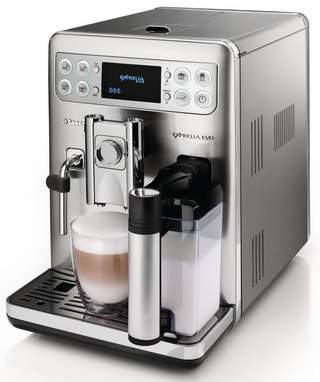 As it’s the case with many other coffee machines currently available, the Saeco Exprelia Evo cannot take oily beans. If you do decide to use them, they will eventually clog the grinder. The Saeco Exprelia Evo is by far one of the best coffee machines you can currently get and the minute you start using it you’ll realize just how much easier you’ll handle those early mornings. The machine features a one point six liter water tank which is enough for most people and it should last you quite a while before you have to refill it. In terms of build quality and materials, the Evo is made of plastic, which makes it a lot easier to clean and has a striking, yet sturdy design. If you’re the type who loves the fresh and authentic taste of coffee in the morning and don’t want to settle for anything less than the best, then you may want to consider getting the Saeco Exprelia Evo. It’ll certainly impress you more thank you think! Gaggia Anima Prestige (View on Amazon.com): For about $1000 less you’ll be able to get the Gaggia Anima Prestige. This is an excellent coffee machine that still stands true to the authentic taste of fresh coffee and helps you brew very delicious coffee every single time. It features a large sixty oz water tank, Rapid Steam technology, but also a single touch auto frothing milk carafe. If you’re the type who wants to contribute to saving the environment, you’ll love the fact that this model has a low energy consumption and goes into standby mode after 60 minutes of inactivity.